Like his brother Hans, Lucas Cranach the Younger trained in the family workshop in Wittenberg from an early age. His early works are extremely close to the style of his father and at this period it is difficult to distinguish them. In the 1530s, following the death of his older brother Hans, Lucas assumed his role in the workshop. His responsibilities increased to the point where he took over the running of the family business in 1550, the year when his father left Wittenberg to follow the Elector John Frederick of Saxony into exile. Lucas the Younger was a painter and also produced designs for prints. Like his father he was interested in politics and occupied various posts in the City Council. He continued to work for the house of Saxony, executing portraits and allegorical paintings as well as subjects related to the ideas of the Reformation. As an illustrator he worked on two editions of the Bible published in Wittenberg and Leipzig. This Portrait of a Woman is dated to 1539, a period when it is difficult to distinguish the different hands in the family workshop. A number of different attributions have been proposed since it was first published by Campbell Dodgson with an attribution to Lucas the Younger. In his initial study of the work Friedländer gave it to Cranach the Elder, and it appeared as such in the early catalogues of the Collection and in the exhibition at the Neue Pinakothek in Munich. 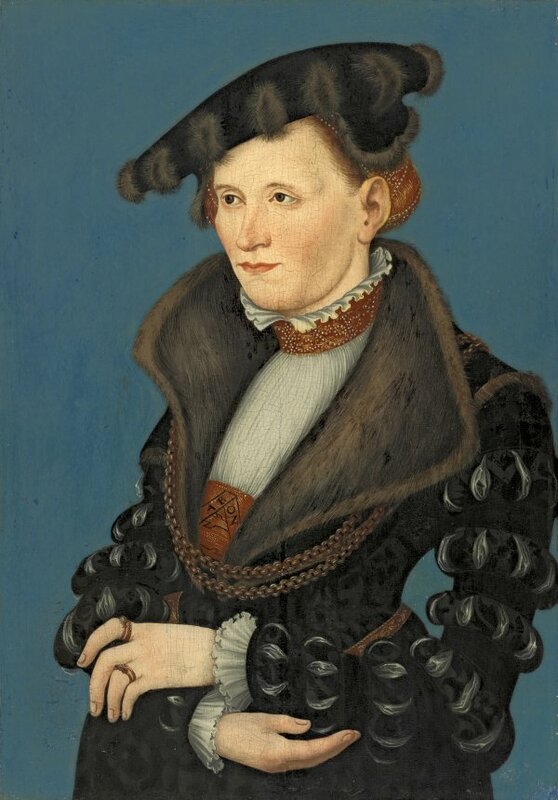 At the present time the painting maintains the attribution of Isolde Lübbeke who compared it in detail with the Portrait of a Man of 1539 in the Museu de Arte de São Paulo, which she suggested forms a pair with the present panel. The sitter, whose identity remains unknown, is presented standing, half-length, against an attractive blue background. She is elegantly but discreetly dressed with various rings on her fingers and a gold chain around her neck. In addition to the elegance of her clothes, embellished by the fur trimming on her collar and hat, she is further distinguished by the delicate manner in which the face is constructed using soft tones and an emphasis on the bone structure. To judge from her clothing the sitter would have been a member of the patrician class, although Zimmerman attempted to identify her with the wife of Duke Frederick of Saxony, a suggestion that has been rejected. With regard to its relationship to the panel in São Paolo, both are the same size and are visually well matched. They also share technical and stylistic similarities. The painting in Brazil, in which the man has a wreath of pinks on his head, has been tentatively identified as a nuptial image. On the bodice of the present sitter is an abbreviated inscription that has been related to the motto A bone fine. The painting entered the Thyssen- Bornemisza collection in 1929.